It may take about a month for the donor stem cells in the bone marrow to begin to function fully. 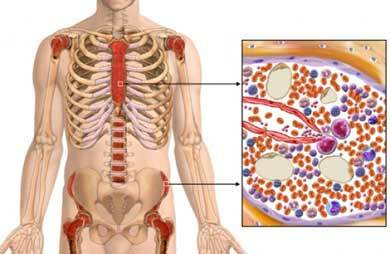 If the transplant is successful, new bone marrow cells will produce healthy red blood cells, white blood cells, and platelets. The donor will be carefully tested to check for diseases. Both you and the donor will be tested to ensure that your tissues are compatible. In order for the transplant to be successful, certain markers on the blood cells and bone marrow cells must match. This process is called conditioning. It will rid the body of diseased cells and clear the bone marrow cavities for the new bone marrow. Anesthesia will not be needed. The donation will be collected before your procedure. The donated stem cells will be filtered. An IV needle will be place through your skin into a blood vessel. The stem cells will be delivered through a tube to the IV. It will take a few hours for the treatment to finish. The stem cells will find their way to your bones. There they will grow new, healthy blood cells. Conditioning will make your immune system weak. It will take some time for the new, healthy blood cells to develop. Your immune system will strengthen as the cells grow. You will need to be in isolation until the new cells develop. This is to help avoid infections while you recover. It may take 1-5 hours for the transplant to complete. There will not be pain while the stem cells are infused. You may have some nausea. This can be treated with medicine. You will need to be in isolation in the hospital for 1 to 2 months. Blood-forming stem cell transplants. National Cancer Institute website. Available at: http://www.cancer.gov/about-cancer/treatment/types/stem-cell-transplant/stem-cell-fact-sheet. Updated August 12, 2013. Accessed September 6, 2016. Stem cell transplant for cancer. American Cancer Society website. Available at:http://www.cancer.org/acs/groups/cid/documents/webcontent/003215-pdf.pdf. Accessed September 6, 2016.